Designed for washing liquid tankers and bulk trailers, the Tank EZ is available in three versions: electric power, diesel power, and battery power. The wide diameter 1600mm ( 5’3’’) brush, will easily reach-in, to clean the nooks and crannies of rounded vehicles such as fuel tankers. The EASY DRIVE 4WS feature is ideal for this large machine. This allows the slightest of operators to work it tirelessly, and with total ease. 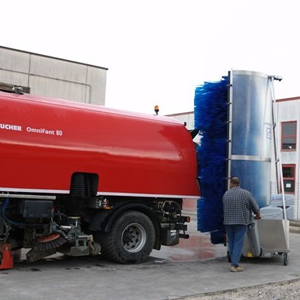 Bitimec produces and sells only the best truck washing equipment. Take a look at our Wash-Bots D Tank EZ to understand why. Designed for washing liquid transports, dump trucks, cement trucks and mixers, the Tank EZ is available with electric or diesel power and a hydrostatic traction drive. The Bitimec Speedy Wash Tank-EZ is an amazingly fast washer for all odd shaped vehicles. For example, it can easily wash tank trucks, bulk transports transfer trailers, construction trucks, and many other vehicles. The large diameter brush cleans around most contours and the EZ-Drive steering is very easy to use. The wide diameter 1600mm ( 5’3’’) brush, will easily reach-in, to clean the nooks and crannies of rounded vehicles such as fuel tankers. A brush only inclination system allows the brush to reach high over the largest tankers. The EASY DRIVE 4WS feature is ideal for this large machine, allowing the slightest of operators to work it tirelessly, and with total ease. We designed Wash-Bot machines to make the job easier and faster. While using far less water, detergent, manpower and time than conventional vehicle washing methods. One person easily operate wash-bots tank wash machine.